Sinn Fein president Gerry Adams is to address Tyrone republicans after the county's Easter Sunday parade in Carrickmore. The TD will be the main speaker at the Tyrone County Easter Parade, which starts at 3.30pm. Encouraging Tyrone Republicans to come along, he said: "Tyrone’s contribution to the fight for Irish freedom is incomparable, not just in our generation but going back over many generations. "The Tyrone Sinn Fein Commemoration Committee has organised over 40 mobilisations throughout the county to commemorate all republicans who have played their part in every generation. "This includes the 56 IRA volunteers of the Tyrone Brigade and the three Sinn Fein activists who laid down their lives in the most recent phase of struggle. "So be in Carrickmore on Easter Sunday, be there to look to the future, pay homage to the men and women who died for Irish freedom but particularly to motivate ourselves to mobilise and plan how we are going to go forward. Bígí Linn. 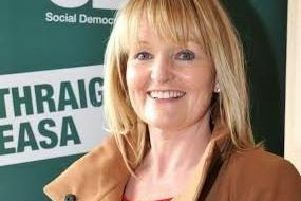 "I am also asking that you proudly wear the Easter Lily as a mark of respect to those who have given their lives in the cause of Irish freedom in 1916 and in every decade since."